"June 13th – Part One"
“June 13th – Part One” hits the ground running, picking up where “Game Over” left off and quickly establishing the parameters of the episode: Noah and Hiro only have three hours to investigate and prevent the bombing of the Odessa peace summit, without stepping on, as Hiro puts it, “too many butterflies.” There are familiar faces galore, from bit player Stevens to Heroes alum Angela Petrelli, and the entire affair pushes forward at an engaging clip. It’s energetic from its opening shot, swooping in on the summit from the point of view of the flying man Noah and Joanne killed in the series premiere. Some of the sloppiness that plagued earlier episodes is present—the insert shot of the cover page of Mohinder’s research is about as blatant as an insert shot can be—but it’s surrounded by scenes with a clear purpose, and it’s remarkable how big of a difference this makes. Every character we spend time with has distinct motivation and a goal to achieve: Noah needs to find Claire, Hiro needs to protect the timeline, Erica needs to keep her dastardly scheme on track. Even Luke is looking for something, hope of an evo-based cure for his son. And because we’re halfway through the miniseries, the characters are allowed to actually discuss what’s on their mind, rather than resorting to unnecessary obfuscation and avoidance. Luke and Joanne’s quiet exchange at the hotel is more affecting than the rest of their scenes combined because for the first time, they actually feel like people, rather than plot devices. The same care is given to Hiro. He spends the episode teleporting around being overpowered and awesome, which is much more fun than it should be thanks to Masi Oka’s charismatic performance, but really, he’s there to not save the day. The Odessa summit bombing has to happen, too much of the season depends on it. Yet when Hiro inevitably comes to this decision, the writing manages to make the choice feel driven by character, rather than the plot. We trust Hiro’s judgement that this truly is the best timeline because of his fervent and consistent concern for ripple effects and the weight Oka gives his delivery as Hiro tells Noah no one can be saved. Which brings us to the first major hiccup of the otherwise very strong episode: Claire’s death. Hayden Panettiere, who played Claire on Heroes, does not appear here and her absence is glaring; one of the drawbacks to making a character indestructible is that if the actor decides they don’t want to continue in the role, you can’t just kill them off. The writers try to hand-wave Claire’s death away with a line about a stroke and Noah’s immediate reaction, that she should come back to life, stands in for the audience’s, but the show don’t follow through with even a faint attempt to explain the sudden and seemingly instantaneous failure of her regenerative powers. Jack Coleman gives a fair performance as Noah sits besides Claire’s body, but he’s hamstrung by acting to an extra under a cloth: Telling the audience Claire’s dead without showing her actual dead body can only have so much weight when Heroes made a habit of retconning deaths that felt far more final than this. The whole scene is awkwardly staged and the perfectly-positioned sheet over the body—long enough to cover her face, but folded forward enough to show her hair—is distractingly convenient. Fortunately, the episode moves on almost immediately, allowing the characters to regroup and plow forward, once again proactive in their attempts to save the world. That regained momentum is disappointingly short-lived, however, as the second major hiccup occurs almost immediately, the reveal that Tommy is indeed the grown baby Nathan, and is prepared for what’s coming. Awkward attempts to work around Panettiere’s absence are one thing, but this scene has the potential to derail the next few episodes. Most of “June 13th – Part One” handles its time travel very well. Noah and Hiro are careful and avoid running into the other Noah and for the most part, everything lines up. But then Angela goes back in time with Hiro and the babies and viewers are treated to a dramatic reveal of what most will have already realized. The writers not trusting the audience to connect the giant, illuminated dots is annoying, but much more irritating is their negating the entirety of the Tommy storyline. Tommy was introduced in the series premiere looking for help controlling his abilities. Now, a year earlier, we see him in control and informed, having been fully trained (presumably by adoptive father Hiro). So he wouldn’t have needed to seek out help in Chicago a year later, so Luke wouldn’t have met him, so Luke and Joanne wouldn’t have gone looking for him, etc. etc. It boggles the mind why after so carefully maintaining the timeline of the first half of the season, the writers rewrite history in the last few minutes of the episode. Of course, “June 13th – Part Two” could retcon this once again, almost anything is possible when you have a telepath in the supporting cast, but for now, it’s a frustrating indication that on Heroes Reborn, as on Heroes, multi-episode storylines and character development will be happily traded away for a cool reveal. Hopefully, this is a blip. Hopefully the writers have something up their sleeves to right the ship and maintain all the gains of this episode: the forward momentum and character beats, the earned reveals and excitement, the focus on fewer, more interesting characters, and perhaps most importantly, the tonal switch from the dour angst of much of the first half of the season to a guarded optimism. 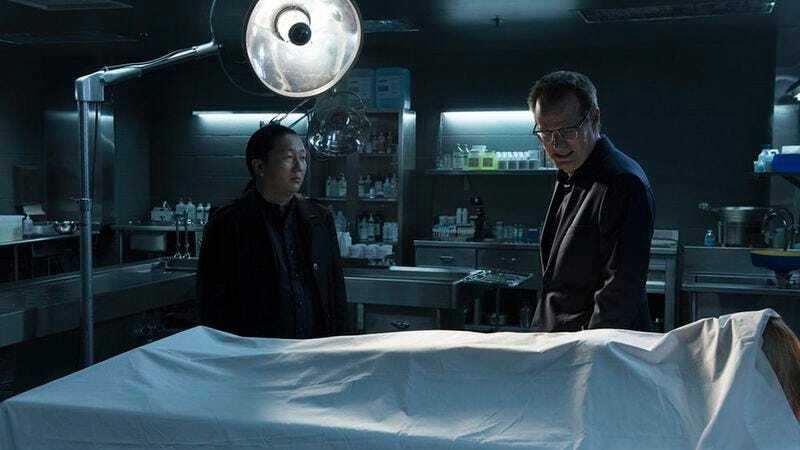 “June 13th – Part One” is a solid, entertaining installment of Heroes Reborn and is easily the high point of the season thus far. It could spark a fresh start for the series, but if the show isn’t careful, its new spark will burn out. Thankfully the voice-overs have not returned, but there is some truly laughable on-screen text this episode. Why does Mohinder need a nametag when Angela immediately addresses him by his name? Why does Angela? Her being a Petrelli is irrelevant for those who haven’t seen Heroes. Plus these coming up during the opening credits, written in the same font, is doubly head-smacking. And yet, “Odessa, Suburb” is my current favorite so-bad-it’s-ridiculous chyron. Speaking of Mohinder and Angela, that is some heavy, inelegant exposition they’re saddled with in the car. At least Mohinder gets to wear cool shoes? Very glad to see Phoebe get some time here, which Aislinn Paul once again makes the most of, and to see Tommy’s mom, Anne, and Hachiro Otomo pop up. Hopefully we’ll get more of all of them in part two. The set design for Phoebe’s room is neat, another visually effective space in a season with more than a few memorable ones. Jack Coleman is a good actor. Noah really, really isn’t. Noah and Caspar are lucky that guard, like Carlos last week, is an idiot. Hiro teleporting never gets old for me. It should, but it really doesn’t. Yes, Claire shouldn’t be dead and whatever excuse the show comes up with for why she is (should they bother doing so) will be a stretch, but let’s have fun with it anyways. I think I could buy Erica using Phoebe to block Claire’s power, knowing she was going into surgery, and killing her that way. Hit up the comments with an answer you could buy, or an absurd one you’d like to see the actors try to sell.